Every seven-year-old deserves a superhero. This is true even (or especially) if your superhero is your crazy granny. Elsa’s granny is the one who teaches her about the Land-of-Almost-Awake to help her forget about her parents’ divorce and the bullies at school and her nightmares. Granny was many things: doctor, prankster, savior, free spirit, fighter of evil, and Elsa’s only friend, so when she is gone, Elsa is lost. Granny, who anticipated this, designed a treasure hunt asking Elsa to hand-deliver apology letters to everyone Granny hurt or let down, and so their joint adventures continue. 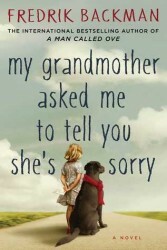 Heartwarming and a bit wacky, My Grandmother Asked Me to Tell You She’s Sorry by Fredrik Backman is a fairy-tale-like story that inspires hope in the real world.